From left: Associate Professor Rozanne Kruger, Nestlé New Zealand Wellness Manager Amanda McDermott, dietetics student and scholarship recipient Katrina Shepherd and Nestlé New Zealand CEO Christian Abboud. 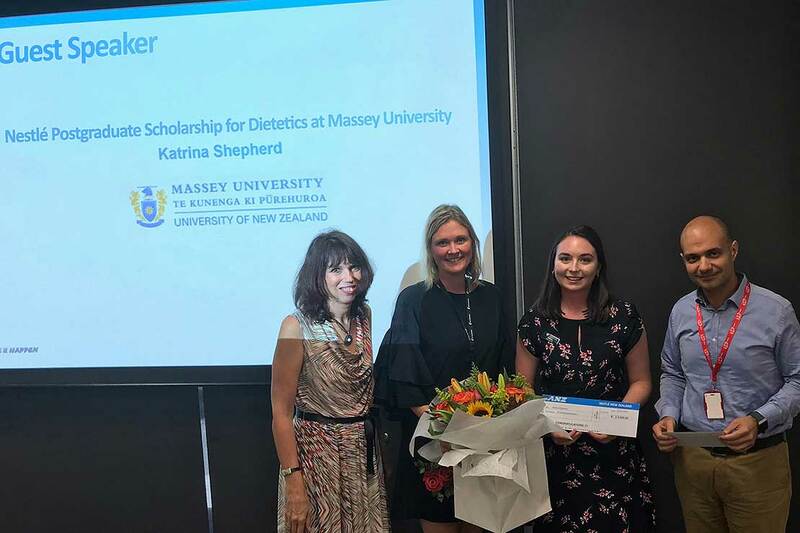 Second-year dietetics student Katrina Shepherd has been awarded a $3000 postgraduate scholarship from Nestlé. The School of Sport, Exercise and Nutrition Postgraduate Scholarship, awarded by Nestlé, provides monetary support for a dietetics student enrolled in their second year of studying the Master of Science (Nutrition and Dietetics) programme. This is the second year the scholarship has been awarded. Finalists were asked to share how they have grown since starting the Dietetic programme and how this has enabled them to bring the Nestlé purpose “enhancing quality of life and contributing to a healthier future for all New Zealanders”to life in their community over the past year. Ms Shepherd has also taken on a study placement based at the Nestlé head office in Auckland. The placement seeks to support the Nestlé Cook for Life programme, building nutrition knowledge, capability and confidence for teenagers in a hands on interactive session about cooking and healthy food choices. The involvement of Massey dietetics students helped deliver the programme to over 500 year 10 students at Manurewa High School, one of the largest decile one schools in South Auckland.